How you handle yourself in the interview can make or break your chances of securing the opportunity you desire. If you are not prepared, it will not matter how right you are for the position or how good you look on paper. You must convey to the prospective employer that you are something special, that you stand out among your peers. Remember, it is our job to get you the interview. However, it is your job to get an offer. KNOW THE ORGANIZATION. The company already knows about you through our presentation of your background and review of your resume. In this same way, it is important for you to know as much as possible about the company before you arrive for the interview. TAKE SOME TIME TO DO SOME RESEARCH. We will provide you with position requirements and information about our client. It is equally important that you invest time in gathering information from their website, talking with industry experts, friends, colleagues, etc. Any current issues effecting the organization are worthy of discussing during the interview. Your preparation will indicate how you will perform on the job. Do it right, do your best! PREPARE TO ANSWER QUESTIONS. Be comfortable when answering questions about who you are and what your skills and ambitions are. Prepare in advance to answer anticipated question (a list of probable question are on page 2). Do not appear to have canned answers. Inject your true personality in your responses. It is very easy to see through too rehearsed answers and stretching of the truth. On occasion your answers should be followed up with a question addressed to the interviewer, it is in fact a two way street of information. PREPARE A LIST OF QUESTIONS. More than likely the majority of your questions will be answered during the course of the interview. However, you do not want to rely solely on your memory. Make sure that questions you have identified during your research of the company are answered (a list of generic question are on page 2) Do not be apprehensive about pulling out your list of questions as the interview progresses. Companies will view this as an organized and prepared approach on your part. There is nothing more unprofessional that furrowing your eyebrows and looking up at the ceiling as you pry your memory banks trying to remember all the questions you wanted to ask. In addition, companies are very often more impressed with the questions you ask than the answers you give. Remember, you want to demonstrate that you are unique and that you stand out among your peers. CLOSING THE INTERVIEW. When it is apparent that the time allotted is up, be the one to initiate closure to the meeting with three statements. Compliment the interviewer on something with regard to his/her personality, enthusiasm, presentation, success or other attributes that you’ve been impressed by. Make a positive comment about the company based on what you’ve previously read and/or learned during the interview. Make a positive statement about your ability to handle the position and reaffirm your interest in it, especially now that you’ve seen the opportunity in person. QUESTIONS TO BE PREPARED TO ANSWER. Why are you contemplating a change, and/or Why did you leave previous positions? Who are your references? (Be ready with names and phone numbers of pre-called, professional references that know your work, and are prepared to speak well of you. Tell me about you. (This is not open invitation to ramble. Emphasize things that relate to the job. Your reply will be based on the research you have done on the company). ACTION WORDS: I planned, created, originated, initiated, developed, conceived, implemented, formulated. RESULT WORDS: It…led to…I…contributed, demonstrated that, saved, reduce, collected, achieved, provided for, increased, evaluated. LEADERSHIP WORDS: I…organized, directed, led, supervised, guided, managed, was responsible for, presided over, coordinated, gave direction to, built. During the first few minutes of the interview, ask the interviewer, “What kinds of qualifications are you looking for in a person to fill the position?” THIS IS IMPORTANT because the information you gain in the response to this questions will provide tremendous insight as to what you will want to share about your experience, education, ACCOMPLISHMENTS, etc. --- now the interviewer must in turn convince you. 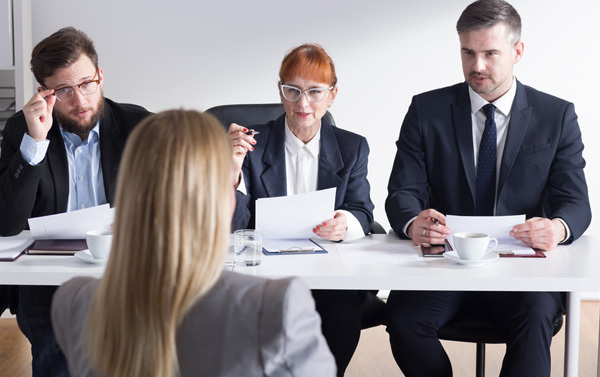 Asking the right questions during the interview will demonstrate your value system, listening skills, sincerity, and how you will take future direction. Listen to total answers without interrupting. The last 5 words in a sentence linguistically have the most meat. SELECT 2-3 QUESTIONS TO ASK EACH PERSON WHO INTERVIEWS YOU. What are some major short- and long-range department/company objectives? What are some characteristics that are unique about your company? In what areas does your company excel or need improvement? What outside influences affect your company’s growth? What would you add or subtract from the last employee to increase efficiency? 7) What major challenges will I face immediately coming into the job? What resources and staffing will be available? Based on what you’ve seen of me so far, where do you think I could contribute the most? Are there any concerns about my ability to do the job? Generic questions for multiple interview situations: Tell me about your career at this company. What excites you about working here?